Finished! 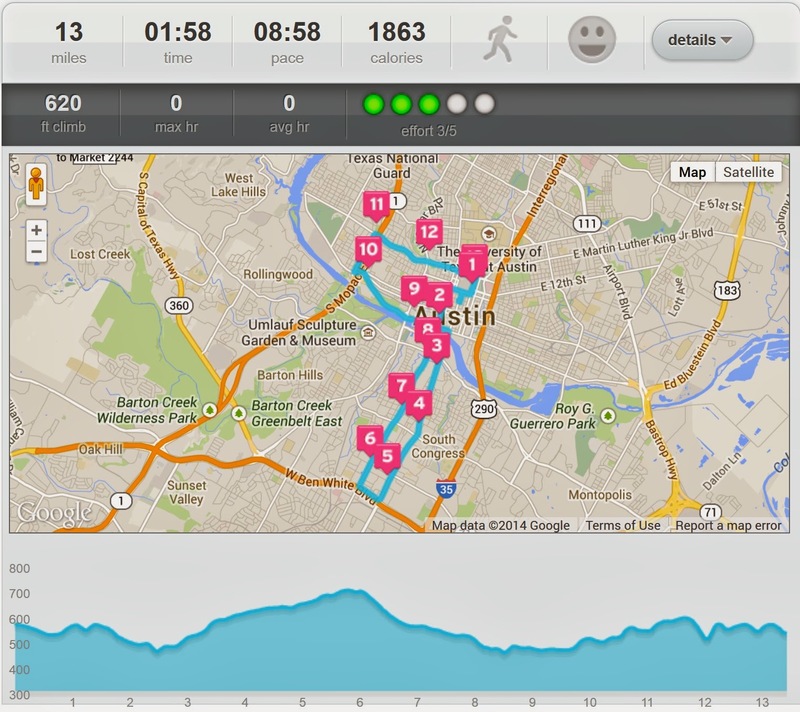 After this morning's Austin Half, I was, quite simply, very glad to be done. My pre-race planning and preparations started well enough, waking-up early enough for my normal Breakfast of Champions (Starbuck's non-fat Venti Cappuccino, Gatorade, yogurt, fruit, and granola.) I arrived at the start corral north of the Capitol with enough time to avoid weaving around the back-of-the-pack runners. My physical condition was acceptable, though clearly nowhere close to my best, as a result of the six-week interruption to my training caused by a calf injury which is now, thankfully, only a painful memory (thanks again, Connie and Sean!) 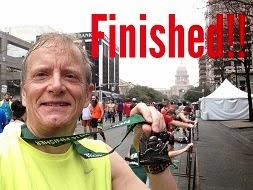 This being the Austin Half Marathon I had intended to do more hill training in preparation, but life got in the way and was only able to do a dozen or so loops around Houston's Miller Outdoor Theatre versus my hoped for Conroe runs. Despite the reasonable 60°F starting temperature, I didn't factor adequately into account Austin's hills and especially this morning's dripping 100% humidity. These led me to seek to match or improve upon my recent Houston performance, thinking incorrectly that my somewhat improved fitness would overcome the heat and hills. By the eighth mile, running briefly alongside my wonderfully supportive wife inquiring my condition, I was several minutes off my hoped for pace so knew I had to reset to my back-up plan. Fortunately, I had one! My new plan was to beat two hours total time, thereby to be below 9-minute average pace. However, with continued hills and growing fatigue working against me I knew it would be a close call as I sprinted the final downhill section past the Capitol to the finish line. I just made it with a 1:57:38 time and an 8:58 average pace. Through my inadequate planning I proved myself not to be a sufficiently loyal disciple of Coach Sean Wade, who preaches incessantly - but evidently, not sufficiently! - about the importance of every runner achieving a negative split on each race and training run. Ultimately, I'm OK with the result. It's being healthy and able to run that's most important; performance is secondary. In the coming days I'll give my body some much needed rest, then will begin my preparations for the Houston Rodeo Run 10K and the always fun Texas Independence Relay! Good show and good self-analysis. Now to look to TIR!